I am inspired by the cameltoe of the Barbie on the left. 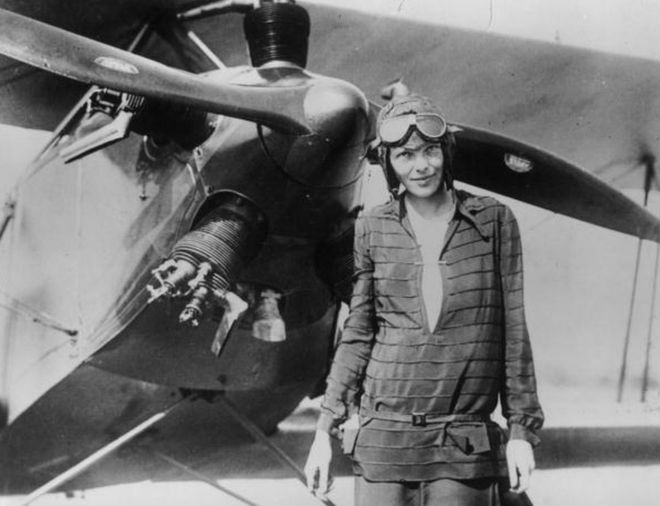 Bones discovered on a Pacific island in 1940 are "likely" to be those of famed pilot Amelia Earhart, according to a US peer reviewed science journal Earhart, her plane, and her navigator vanished without a trace in 1937 over the Pacific Ocean. Many theories have sought to explain her disappearance. But a new study published in Forensic Anthropology claims these bones prove she died as an island castaway. The report claims they are a 99% match, contradicting an earlier conclusion. The study, titled Amelia Earhart and the Nikumaroro Bones, was first published by the University of Florida and conducted by Professor Richard Jantz from the University of Tennessee. It disputes that the remains found on the eastern Pacific island of Nikumaroro - about 1,800 miles (2,900km) southwest of Hawaii - belonged to a man, as a researcher had determined in 1941. Earhart was known to have been near the island when she vanished during her doomed attempt to fly across the globe. A British party exploring the island for habitation in 1940 found a human skull, a woman's shoe, a Navy tool used by her navigator Fred Noonan (who also vanished), and a bottle of the herbal liqueur Benedictine - "something Earhart was known to carry". "There was suspicion at the time that the bones could be the remains of Amelia Earhart," Dr Jantz wrote in the study. The party found a total of 13 bones, which were then sent to Fiji to be analysed by Dr D W Hoodless, who concluded that they had belonged to a male. But Dr Jantz argues that because forensic osteology - the study of bones - was still in its early stages, Dr Hoodless probably reached a wrong conclusion. "Forensic anthropology was not well developed in the early 20th century," the paper states. Consulting Dr Hoodless' measurements of the bones, Dr Jantz used Fordisc, a modern computer programme now widely used by forensic anthropologists, to compare them to Earhart's height and body stature. The bones have unfortunately since been lost, and so cannot be analysed. But the research team used historical photographs, as well as her pilot's and driver's licences, to determine that her body proportions matched the skeletal remains. A "historical seamstress" was also consulted to analyse her clothing, including "the inseam length and waist circumference of Earhart's trousers". "This analysis reveals that Earhart is more similar to the Nikumaroro bones than 99% of individuals in a large reference sample," the report states. The research found the remains belonged to a taller-than-average woman of European descent, as Earhart was. "This strongly supports the conclusion that the Nikumaroro bones belonged to Amelia Earhart." "Until definitive evidence is presented that the remains are not those of Amelia Earhart," Dr Jantz writes in the paper, "the most convincing argument is that they are hers."